The interminable summer is over: The Jets and Giants begin their seasons this Sunday. Earlier today, we looked at the Jets' most significant additions, and our weeklong preview of the local 53s continues with a look at the Giants' newest faces. Last month, the Giants' vice-president of communications went on Twitter and told fans to stop being so damn pessimistic. Needless to say, this kind of thing wasn't happening in Philadelphia. 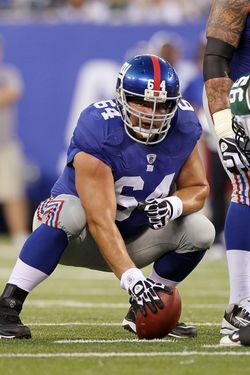 The Giants had lost Kevin Boss and Steve Smith during free agency, Plaxico Burress chose the Jets, and the team cut ties with longtime linemen Rich Seubert and Shaun O'Hara. Which is to say: This off-season was more about who the Giants lost than who they added. That said, they did poach a few pieces from other teams. Below, a look at three free-agent acquisitions. David Baas. Here's how close Eli Manning had become close with O'Hara, the team's longtime center: With Hurricane Irene approaching the area two weekends ago, Manning went to stay with O'Hara and his wife. There had been remarkably little turnover on the Giants' offensive line over the past several seasons, but the loss of O'Hara and Seubert opened up a couple of jobs. One of them will go to Will Beatty, who will start at left tackle. And the other will go to Baas, who started all sixteen games for the 49ers in both 2009 and 2010, and will now try to establish chemistry of his own with Manning. Steve Weatherford. Or as he's known to Giants fans, "Not Matt Dodge." Not to pick on Dodge, who was cut over the weekend, but special teams were a season-long concern last year, and punting, especially, was an adventure. (Let's not even bring up the end of that Eagles game.) Dodge, a rookie last year, apparently made the Giants' decision a tough one with his performance during the preseason competition for the job, but Weatherford, a five-year veteran, was the safer choice. Weatherford, who landed half his punts inside the twenty last year, had a net average of 38.1 yards per punt in 2010, a career-high. "You ask me who the best defensive tackle is in the NFL, I'll tell you Jimmy Kennedy," Kennedy said Wednesday. "Whether y'all believe it or whether I believe it in my head, that's all it takes." Kennedy elaborated, using a film reference. "It's like the movie 'Shallow Hal,'" Kennedy said. "If I believe the chick is hot, and she's hot for me, then it is what it is." In reality, the Yonkers product was drafted twelfth overall by St. Louis in 2003, but never established himself as an elite player. But Kennedy does give the Giants some depth at defensive tackle with rookie Marvin Austin out for the season.